Join us for our monthly Plant Sale Fundraisers every Second Sunday. You will find a scintillating selection of succulents for your home or garden. Pick up a few for yourself and friends. Please click here to donate to the Generosity.com funding campaign﻿ for rent, insurance and utilities. 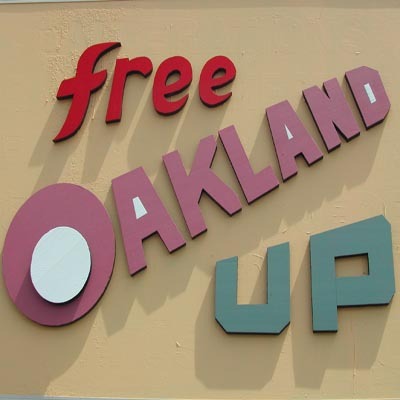 A HUGE Thank you to everyone who is sharing Free Oakland UP on their blogs, websites, and social media!! Carolyn Jones wrote a great article in Oakland Magazine. Apartment Therapy shared Free Oakland UP on their design blog. SF Girl by Bay shared on her Facebook Page! Oakland Local wrote an article on Oakland Thrift Shops! KTVU's Rachel and Evan created a video and write-up on Free Oakland UP! Click here to see the video, Click here to read the write-up. Sarah Burke wrote a great article in the East Bay Express. And Claire Bresnehan wrote a great article for the Mills College Campanil. Thank you to the merchants who offered space for pop-up galleries and artists who particpated in the November and December First Friday Free Art Walks. Click here for event info on FB. Free Art Gallery: offers monthly solo or group exhibitions featuring experimental, interactive projects focused on alternative economies, cultivating socially activated art, sustainability and building community through art and active participation. Free Gift/Thrift Shop: filled with select vintage to new giftables, collectibles and household items looking for a new home. Yes, everything is free. Artist Residencies: encouraging artistic reuse. This permanent Free Utopian Project is made possible through the generous donations of patrons like you, either of art and objects or financial gifts. Accepting donations of giftables, garden items, vintage and antique items, small furniture, art and craft supplies, and sundry items. Please no clothing, broken appliances, or large furniture.